I saw someone on Facebook put up a link about salad in a jar and wondered what that was all about. Next thing I knew, I'm watching youtube videos on how to do it, ordering accessories for my food saver and hurrying to the store for produce and jars. My interest in the salad in a jar concept came because the salad is supposed to stay fresh up to a week after it's been sealed in a jar. I can never get cut salad to stay fresh. Plus I thought the salad looked cool in the jar...LOL! And it's a quick meal, immediately ready! For much cooler pictures of salad in a jar, recipes and instructions, check out Salad in a Jar and Healthy, Happy Life (it's vegan but you can substitute meat things if you like). I decided to use my Cricut machine and the new Cricut chalkboard vinyl to make some labels to go onto the jars so I could label and date them. I cut the labels (scalloped and regular circles) at 2.5" and 2.25" from the Cricut Craft Room Basics free set of images. I layered the chalkboard layer onto the regular vinyl layer. I'm not too concerned about it holding up as I have plastic cups with vinyl on them that I made two years ago that look new. And I wash those in the dishwasher all the time. A couple things about the Cricut chalkboard vinyl: It needs be cut at pressure of 4 and blade depth of 4, speed at 3. Also, it comes with a sheet of transfer tape in the package (woo hoo!). After working on taking photos of food, I have a newfound respect for those food bloggers...it's really hard! I can't wait to get back to photographing paper projects..hee hee! Are you going to try "salad in a jar"? Awesome! They do look so cool! Great project! This is awesome! I have been looking at the salad in a jar idea, but I never thought to label them like this! Great idea! We have a big chalkboard downstairs that my teenage daughter & her friends like to write & draw on when they "hang out". I don't like chalk dust so I have them use Wet Erase Markers. Would the wet erase markers work on the Cricut Chalkboard Vinyl? Thanks for posting the link--I'll definitely check this out. I love your chalkboard labels! Thanks for sharing! What a neat idea! I like your use of the cricut vinyl to keep track of the date and what is in the jar. So the question is - does it really keep for up to a week? How interesting! I'm going to check this out! Thanks for the idea. 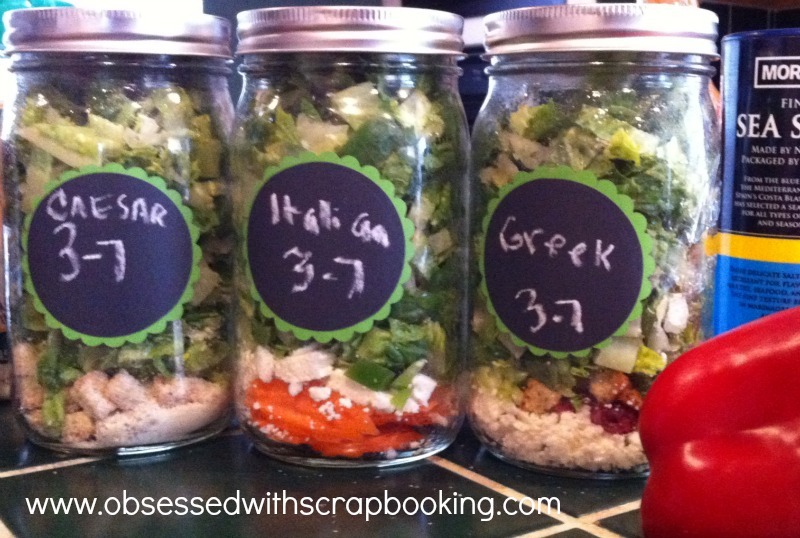 What a great idea to do on a Sunday and have ready-to-eat lunches all week! Thanks for the setting tips for the blade on the vinyl. I've seen these ideas floating around but never tried a Salad In A Jar! Let us know how long they stay fresh! LOVE the way you used the Chalkboard vinyl on them! Great idea!! Will be making salads in a jar for sure!! Thanks! I have never heard of salad in a jar and I love the idea! I have put oreo cookies, chocolate chips, and tootsie rolls in quart jars and vacuum sealed them - and six months later when my husband was on a chocolate kick and couldn't find any in the house, I brought out the oreo jar and they were still as fresh as when I opened the bag. I am going to try this salad so I can have "healthy fast"! Thank you. 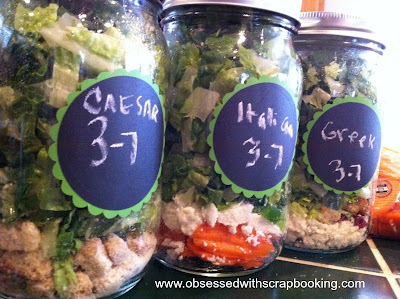 what a great idea and way to keep those salads freash thanks for sharing, god bless. How Interesting! Thanks so much for sharing it! What a clever idea. Thanks! I want to make some of the vinyl chalkboard labels but I'm not familiar with the Cricut at all. Do you have to use their paper? Or can you use commercial contact paper that already has the sticky backing? - Well at least it says that it has a easy peel liner.